John Deere is expanding its lineup of Worksite Pro attachments with the introduction of its new roll-out bucket offerings: the RB72, RB84 and RB96. The buckets utilize the compact wheel loader or compact track loader’s auxiliary hydraulics to roll out and dump material in order to achieve a significantly higher dump height. Rather than requiring the machine’s hinge pin to be raised higher than the hopper for dumping, the roll-out bucket pivots near its cutting edge for additional dump height. Improved material spillage control is provided by 114 degrees of roll-out. For added durability, the buckets incorporate high-strength, large-diameter pivot pins. Additionally, the universal, self-cleaning Quik-Tatch easy-attachment system allows operators to switch from one type of attachment to another within seconds. Three bucket widths are available: the 72-inch RB72, 84-inch RB84 and 96-inch RB96. 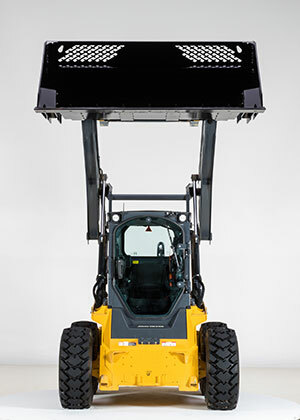 The new roll-out bucket attachments are backed by John Deere parts, service and warranty coverage.